A reliable customer favorite, Candy Hybrid Onion combines the best qualities of short-day and long-day onions. A day-neutral variety, it bears large, white bulbs with a mild flavor. They're great eaten raw, on sandwiches, lightly cooked in salsas and stir-fries, and cooked into meat dishes, casseroles and other recipes. It's also a fairly good storage variety. Onions' growth is affected by the amount of light received. 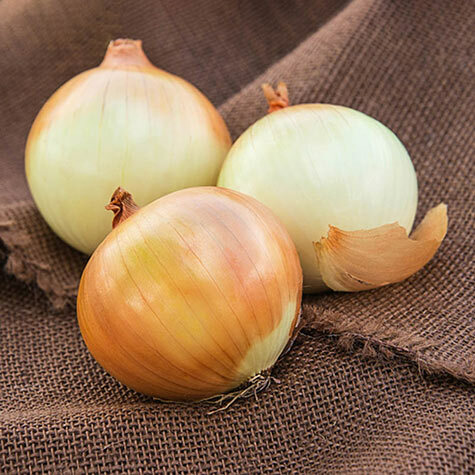 Day-neutral onions, like Candy Hybrid, begin forming bulbs when daylight lasts 12-14 hours, making them well adapted throughout many areas of the United States, except the far North and deep South. 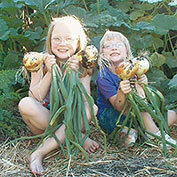 Onions grow best when planted in full sun and well-drained, fertile soil. 85 DAYS. Spacing: 4 - 6 inches. Days To Maturity: 85 days from seed. 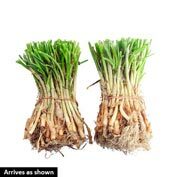 Comments: Versatile and great for storage, this disease resistant onion grows well in both northern and southern climates. A strong root system allows Candy Hybrid to grow jumbo-colossal size bulbs that are well-formed and deliciously sweet.